Many believe that a cassata is an ice cream cake made out of assembled layers of ice cream. But no Sicilian believes this. The unrivalled Sicilian cassata is made with ricotta. Some people differentiate between the two cassate by referring to the one made with ice cream a Neopolitan cassata, this may be because it is very much like Neapolitan ice cream composed of three different layers of contrasting colours and flavours – one of chocolate, a red coloured variety which sometimes can taste like strawberry and a vanilla flavoured one mixed with nuts and glace fruit. In Australia the pink layer in the slices of that particular ice confectionary called a cassata is sometimes made of cake soaked and flavoured with a pink cordial like essence. In the early 19th century, the ice cream makers of Naples were famous for making moulded, opulent, ice cream layered cakes and these were called cassate. The Sicilian cassata is a round, moulded cake shaped in a bowl lined with layers of sponge cake, the chief ingredients are sheep’s milk ricotta (it is sweeter and more delicate than ricotta made with cows milk), mixed with sugar, small bits of dark chocolate and candied citrus or zuccata (candied pumpkin). Within Sicily there are some variations which vary by location and family tradition, for example some recipes include an additional layer of sponge cake in the centre as well as the casing. Cassata was once more popular at Easter, but it is now eaten at any festive occasion in Sicily including Christmas. The Sicilian cassata, however, has much older roots than the ice cream cakes popular with the Neapolitans. Some say that the word cassata may have come from the Roman name for cheese, caseus ( the Sicilian word for cheese is casu` or caseata). There are baked versions of Sicilian casssate and these are often made at home. 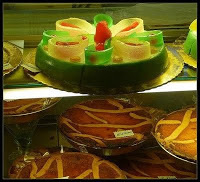 The uncooked version of cassata can also be made at home successfully, but usually my relatives order their cassata from a pasticceria – it is left to the experts to make, mainly because cassate are usually elaborately decorated by pasticceri. The cassata is left to set and once it is turned out of the mould it is spread with apricot jam. It can then be covered with a sugar fondant(this is often coloured pale green because at one time cassata was covered with marzipan made with pistachio meal). Some of the cassate in pasticcerie are often very baroque and white and green striped fondant is used. They are then decorated with ribbons of zuccata (candied pumpkins) and are often sprinkled with silver sugar balls. My preferred option is to cover it with marzipan and candied fruits and I have no trouble making the marzipan (see previous post). I first made cassata using Ada Boni’s recipe from her Italian Regional Cooking book – this is a very fine and old publication which has been out of print for some time. My cassata recipe, through the ages, has developed to the following and it always seems to taste good, even if it is not as professionaly decorated as the images in this post. The marzipan can be made well ahead of time (see earlier posts, marzapane).I have also used marzipan fruit as decoration(this is not traditional). Process: Beat egg yolks with sugar until creamy. Fold in egg whites separately until very firm and add them to the mix. Slowly fold in the flour, then add flavours. Bake sponge cake in moderate heat for approx. 40 minutes. Blend the ricotta with the sugar (some use a syrup made with sugar dissolved over heat in a little water, allow the syrup to cool before using.) Slowly stir in the vanilla, cinnamon and a dash of liqueur (do not use this if you have used a sugar syrup). Press the ricotta mixture into the lined mould, smooth the top and cover with a layer of sponge cake.Sprinkle with more liqueur. I usually refrigerate the cassata overnight (to set) and cover it with marzipan about 2-3 hours before I serve it. Turn the cassata out of the mould when it is ready to cover with the marzipan and spread the outer with a thin layer of apricot jam. I have had a request to explain about the type of ricotta to use. I always buy the solid ricotta, usually sold in large rounds – vendors slice it to the required weight. I never buy the ricotta sold in the tub – it is far too watery( and often tasteless). If this is the only ricotta that you can purchase, it is a good idea to drain it overnight.